Saturday went quite well sleeeeeeeping zzzzzzzzzzzzz till 11 am in morning, though I went to sleep early (10pm) on Friday. After having Fresh up went upstairs to Mohans room, Suddenly we planned to watch all the DVD Movies we burned this week. 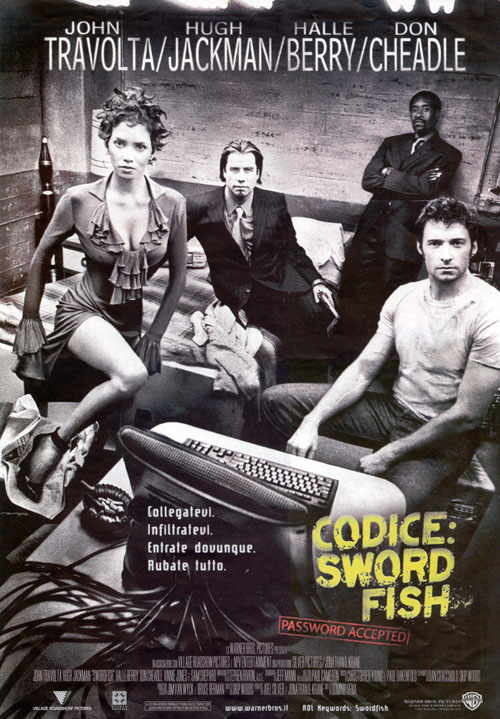 So Started with the Thriller SOWRDFISH (staring JHON TROVOLTA,Helly Berry), In this futuristic technology spy movie, John Travolta plays Gabriel Shear, a man who is desperately trying to access information that is locked inside a complicated computer system that contains mountains of government secrets--and money. He hires Stanley Jobson (Hugh Jackman), a desperate computer expert, to help him hack into the system. Change taste to watch JOHNY ENGLISH (Rowan Atkinson,the MR Bean)thanks to the precision clowning of Atkinson and what is, until that last scene, the wittily nonchalant arrogance of Malkovich (who relishes in the cartooniest French accent in movie history), "Johnny English" earns enough raucous laughter to send audiences home wanting to describe scenes to their friends. . The Last one SCHOOL OF ROCK...is awasome in every way you look at it. This film is the ultimate Jack Black project. If you don't like the man or his antics,I'm not entirely sure if you will appreciate the film or its humor as much as I did. I actually like him quite a bit, love his over-caffeinated persona, his hilarious body contortions and his love of rock and roll, and all of those elements, along with a pretty cool soundtrack and a decent array of cute musician kids, made this film very enjoyable to sit through, despite its overdone concept (teacher does good) and its predictability factor. The film's trailer actually doesn't do it justice with Black cracking me up in nearly every other scene here. It's obvious that director Linklater let the man loose on the set and Black takes full advantage of his child-like qualities to lace every sequence with his trademark energy and off-the-wall behavior. boom booom booomm Every one should see..
Sunday went really tough , so hot in the day time, some of us were here in office for the samlearning project. The Whole Digit team working for the issue close (as JUNE 2004 is the third Anniversary issue).Mr Admin, Praveen give some insight into the Operating System World,the Architecture and the involvment of Scandinavian countries in the development of some of the fastest and robust OS in the world,including FreeBSD,Mynix and The Linux. Went to bed Late .......uff at 2am. Current Mood : Fresh..its Monday Morning . Current Song : "listning the Fan blazing near me"